The most noticeable aspect of the California state flag is the large California state grizzly bear that dominates the surface of the flag. This animal is the official state animal of California. It is also used in the design of the flag to represent strength. The flag also features a star that symbolizes sovereignty. The colors selected for the flag also have symbolism, with red standing for courage and the white field representing purity. There are several colors used in the design of the California state flag. The most prominent feature—the California grizzly bear—is designed using two shades of brown: seal and maple sugar. The bear is walking across a field of green grass. There is also a red stripe at the bottom of the flag, as well as a star in the left corner that is the same shade of red. The text California Republic is written in brown and located between the bear and the red stripe. During the 19th century, a coup led to the declaration of Alta California’s independence. During this time, a flag was used during the rebellion that became known as the Lone Star Flag of California. This flag featured a red five-pointed star on a white field. The star from that flag is represented on the modern state flag of today. It is believed that flags depicting the grizzly bear have been used since the 19th century. The original flag featuring a bear was first used for a brief period during 1846. The flag was used throughout the 19th century and was used during the Civil War by people who supported the secession of the south. It wasn’t until 1911 when the bear flag was made the official state flag. The 1911 law outlined the specifications of the flag that is still in use today. 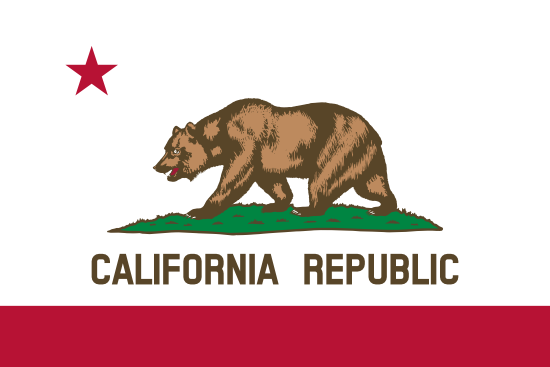 The California state flag is also known as the Bear Flag. The flag used today was first adopted on February 3, 1911. It wasn’t until 1953 when the image of the bear was standardized.